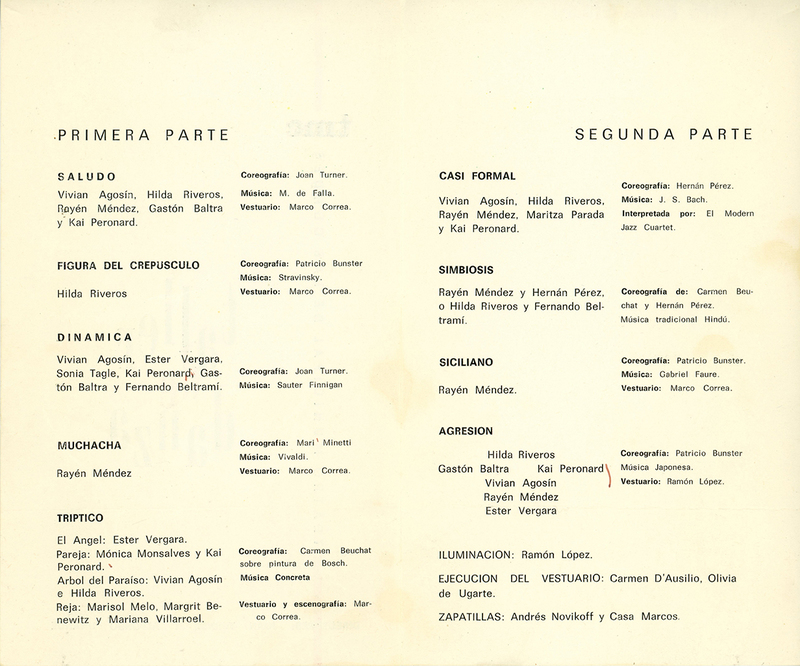 Program of a dance workshop directed by Joan Turner and Alfonso Unanue, that took place at Teatro Municipal de Las Condes. 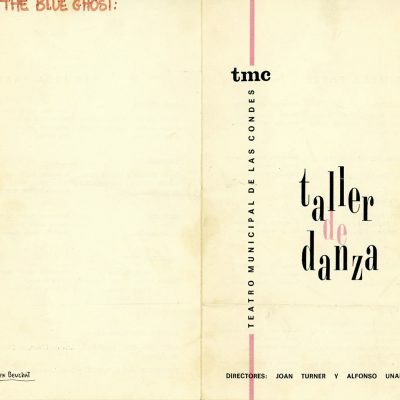 The first part contains the following choreographies: “Saludo” by Joan Turner, “Figura de Crepúsculo” by Patricio Bunster, “Dinámica” by Joan Turner, “Muchacha” by Mari Minetti and “Tríptico” by Carmen Beuchat. 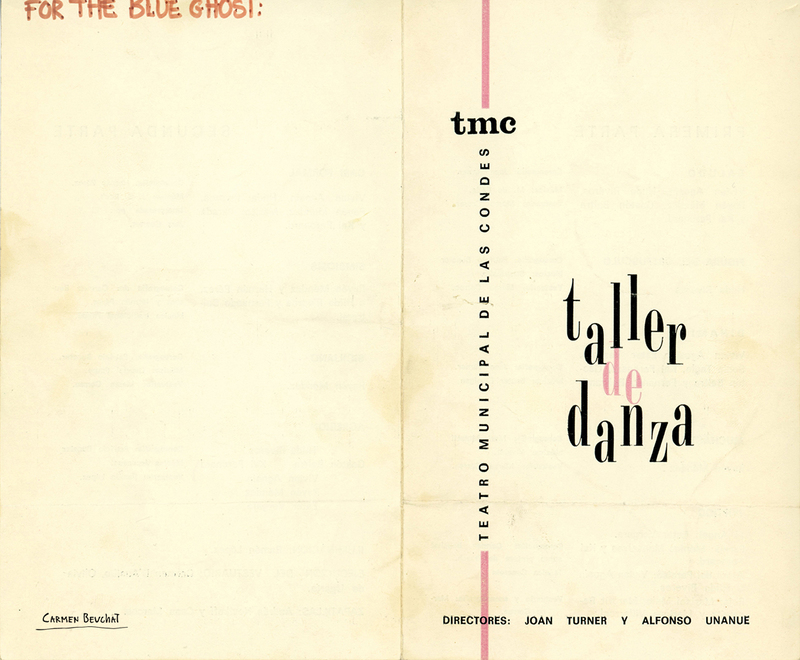 The second part has the following choreographies: “Casi Formal” by Hernán Pérez, “Simbiosis” by Carmen Beuchat and Hernán Pérez, “Siciliano” by Patrico Bunster and “Agresión” by Patricio Bunster. The dancers that participated in the program are: Vivian Agosin, Hilda Riveros, Rayén Méndez, Gastón Baltra, Kai Peronard (senior), Ester Vergara, Sonia Tagle, Fernando Beltrami, Mónica Monsalves, Marisol Melo, Margrit Benewitz, Mariana Villarroel and Maritza Parada. Lighting: Ramón López. Costumes: Marco Correa and Ramón López. 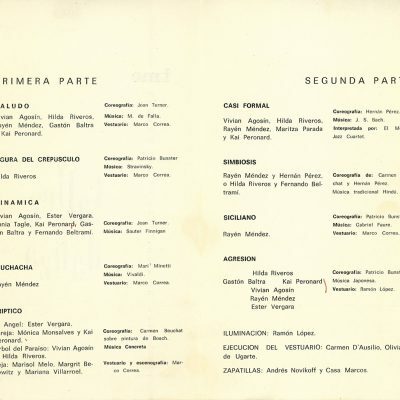 Physical Description: Program 18,4 x 11 cm.